Rendering, the process of generating a image from a 2D or 3D model. Possibly the most important component in any video game or CGI. In which there are a variety of techniques to choose from the most common of which at the moment is rasterization which is what you will find in all modern day games. In this technique you take in vertices and normals of a model, interpolate these across pixel space to create an image. For example if you have 2 points A and B and want to draw a line, interpolate from A to B and fill in all the pixels along the way. This technique is decades old and very highly optimized but as time moves on the visual effects demands higher quality images which requires more complicated techniques of rendering. This is where ray and path tracing comes in. You will find this very common in CGI as it creates very high quality images but is in no way fast enough for for games (Yet!). In this post I will try to give you a basic idea of what they are and how you would implement them in computer graphics. In layman’s terms the process of ray tracing is the attempt to simulate photons of light through mathematical formulae such that we can create images on the screen. 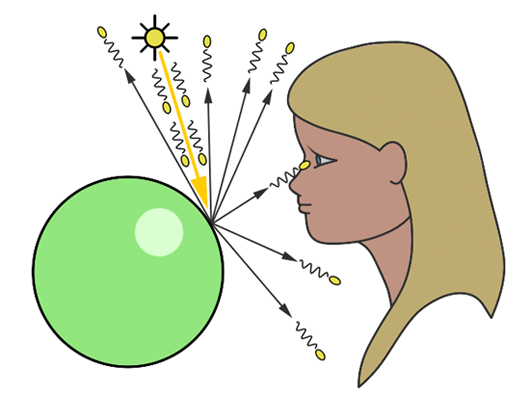 In reality billions of photons come from a light source bounce off objects in many different directions of which the photons angled correctly hit our eyes enabling us to see. This is exactly the what we are trying to simulate with ray tracing but with some cheats so that our computers can handle it. In our scene we will have a light source, some objects and finally a camera which represents our eye. In reality billions of photons are emitted from our light source in infinite directions and the small percentage of rays land in our camera/eye would create our image. Sadly we can’t simulate this in computing, or at least if we did it would take years to do due to the vast quantity of rays we would have to calculate which may not even land in our camera. To overcome this we use a method very imaginatively named Backward Tracing. In this method we will back trace rays from our camera to an object and then to the light source. This saves us calculating all the billions of unnecessary rays and just keep the ones that create our image. So at our current state we have one ray hitting something in our scene creating a small dot of our image. Now to create our full image all we have to do is send more rays. Imagine if you will you are painting a picture but can only use dots, if you paint enough dots you will eventually be able to create a full image. To convert this into terms of rendering we effectively need a ray for every pixel we are trying to draw. So image we have a plane in front of our camera. We divide this plane into a grid and fire a ray from our camera through one of the cells (our pixels) of our grid. We calculate whether or not it intercepts with something in our scene and if it does we use the colour of that object for that pixel. Effectively at a very basic level this is how our ray tracer works. Path tracing is almost an extension to ray tracing. It is a lot more physically accurate creating even higher quality images but again but sacrifices speed in calculations. Instead of the rays hitting the object and then sending it straight to the light source it will continue to bounce around the scene accumulating colour values until it eventually hits a light. Some materials behave differently, some may have a high reflectivity and others a level of refraction or transparency which mean our rays will have to behave differently as well to colour them correctly. For example if we have a shiny red sphere next to a blue sphere, the red sphere will reflect some of the blue from the other sphere. This means our rays must do more “bounces” before reaching our light source, this in turn means more calculations which equals longer rendering times. So that’s a brief introduction to ray and path tracers. Soon I hope to look into explaining more in depth about the mathematics used in these techniques such as shading formulae and how to calculate the reflections of the rays in the scene.